Hello friends! Fall has arrived and I've just finished my fall decorating! 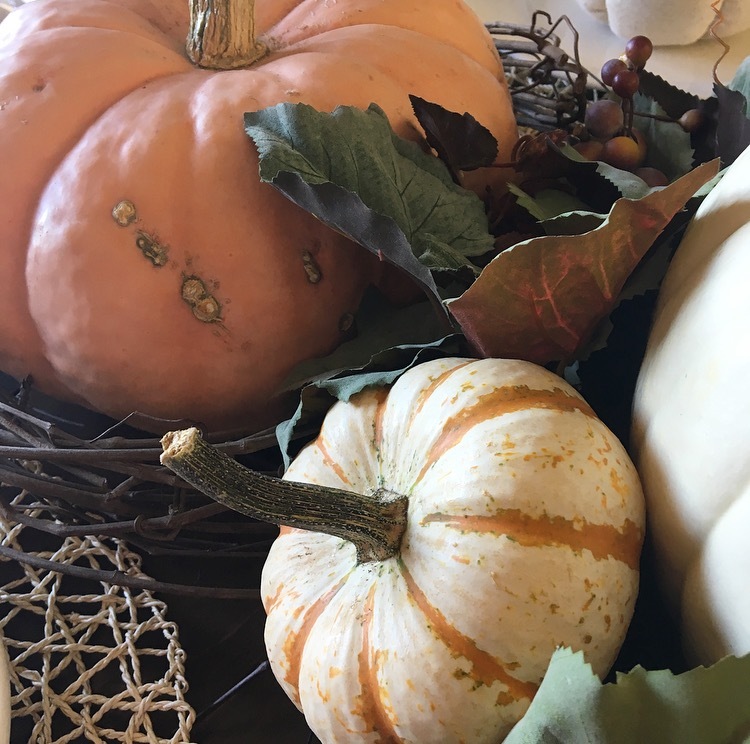 I'm really looking forward to all that fall brings...soups, crisp air, the turning of leaves, boots and sweaters, and of course football! I always love for my home to feel cozy through every season and I think I've accomplished that in my fall decorating. I'm so very excited to have teamed up with 13 wonderful ladies to bring you a fall home tour blog hop! At the end of my post you'll find links to visit my fellow bloggers tours! They are a must! 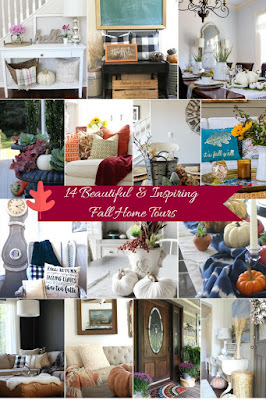 Such amazing talent and beautiful homes. Let's begin! 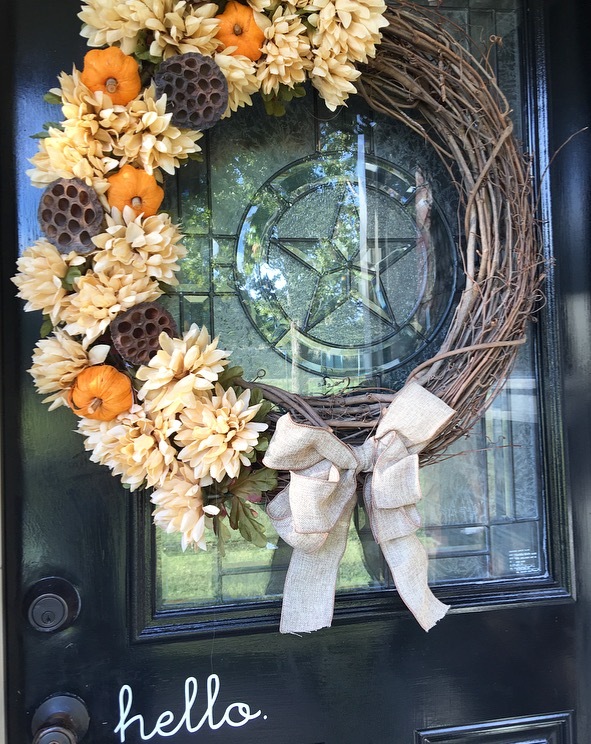 My entry way is always one of my favorite places to decorate. I found these buffalo check pillow covers on Amazon for super cheap! I absolutely love them! I layered this "Thankful" sign in front from Six Eleven Co. and added some vintage touches with the crock and old galvanized jug. I also added some Pampas Grass stems to the crock..Pampas Grass is always a great and easy "go-to" when filling vases or crocks! Especially during the winter and fall. 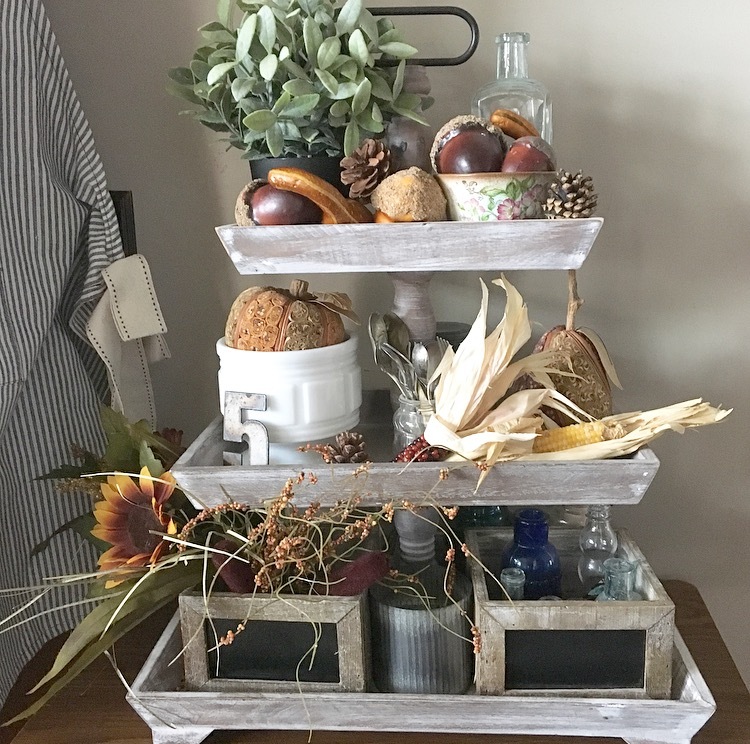 I decorated my three-tier stand using a lot of nature elements. 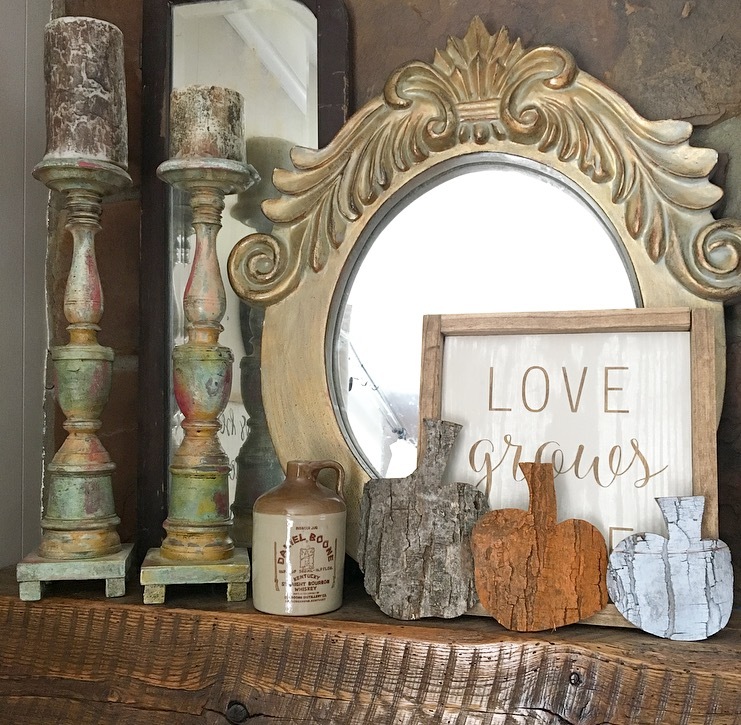 This corner of my kitchen is one of my favorites! 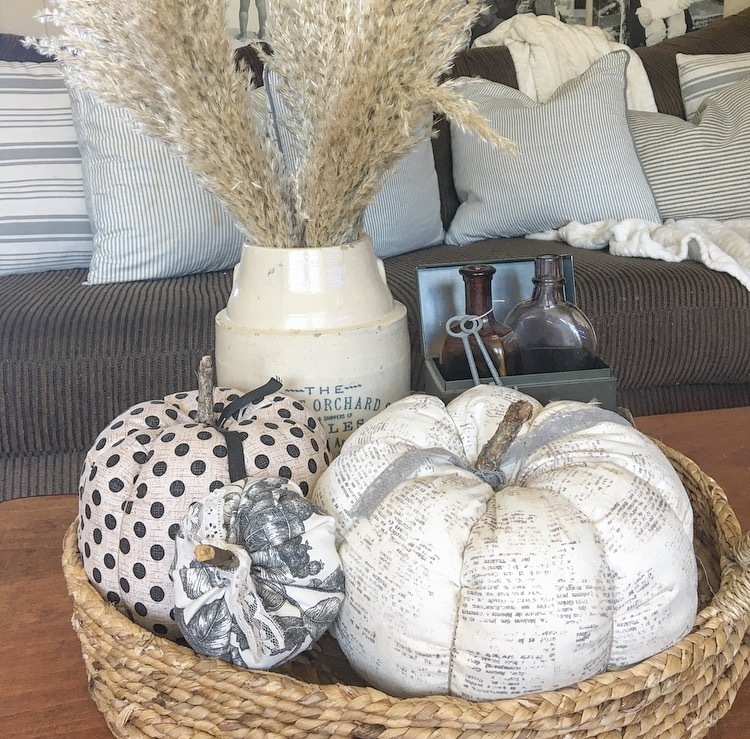 I love switching up this cubby from Vintage Farmhouse Finds for the different holidays and seasons. If you follow me on Instagram then you know my grandpa made these old tractor seat stools. 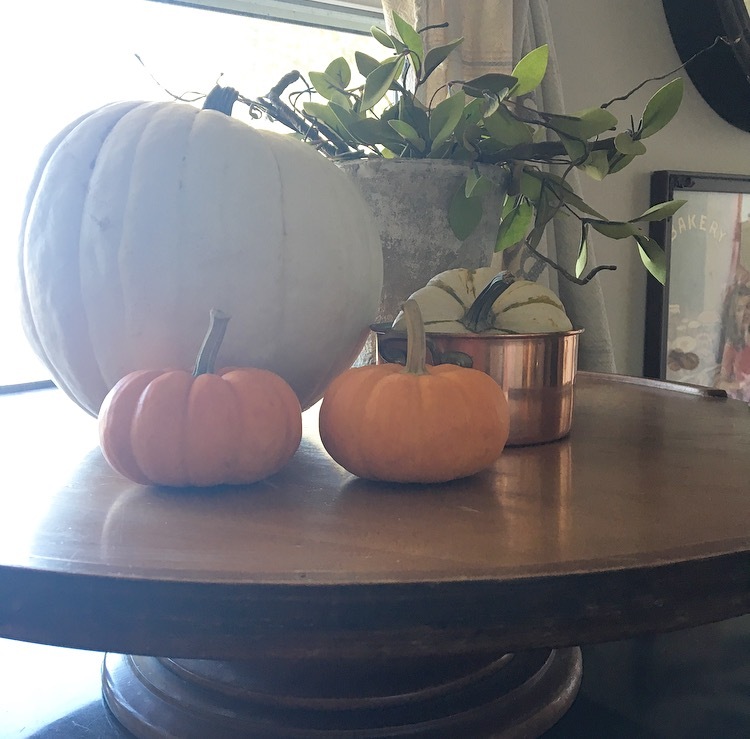 He used them while gardening and was thrilled when I asked him if I could have them. I found this BIG lazy susan at a garage sale over the weekend. I have plans to paint it but for now I have it setting in my kitchen with a few pumpkins and some greenery. My dining table is always fun to decorate..especially since I gave it a makeover which you can find here. 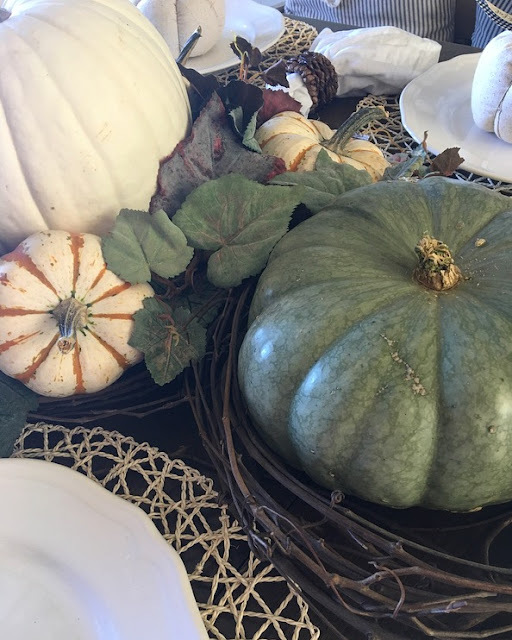 I used heirloom and tiger stripe pumpkins with some dried vines and greenery for the centerpiece. The green one is my favorite! It's such a pretty color. 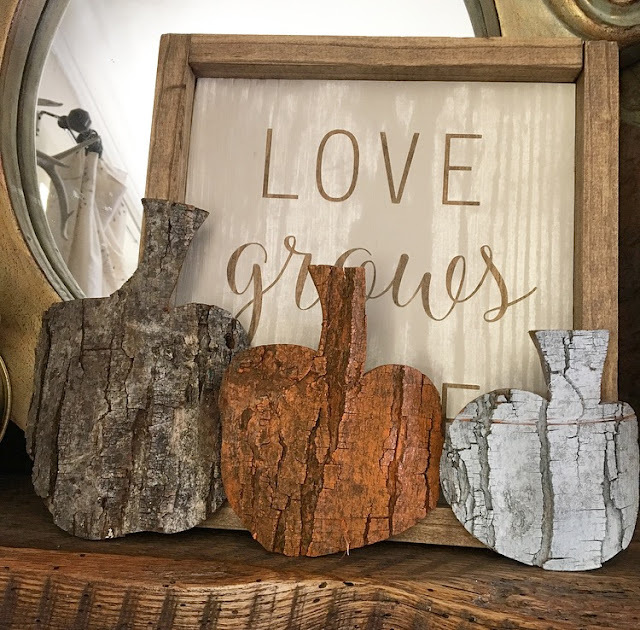 I found these "tree bark pumpkins" at Mile High Designs in Oklahoma. Aren't they so neat?! This painting is from Ashley Anthony Artwork. It's so gorgeous. Ashley does beautiful work. 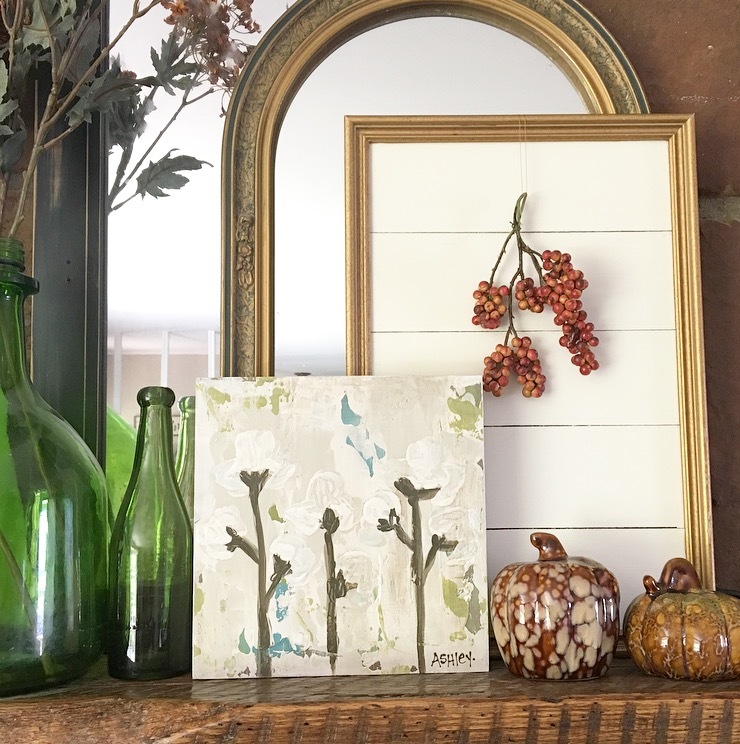 This painting is called "cotton blues" and it's perfect for fall. 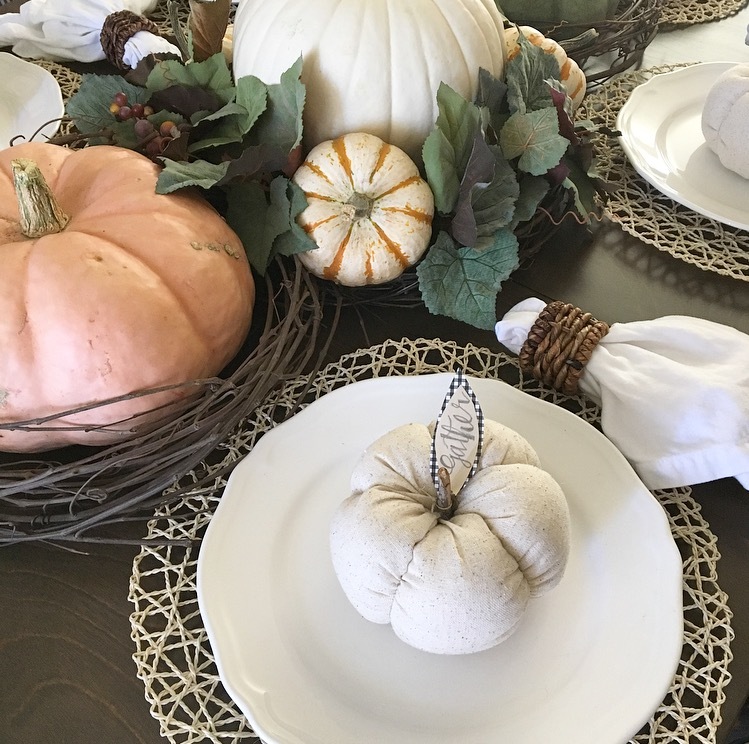 I also made these fabric pumpkins on my coffee table..they are kind of an addiction! I also found this bottom of an old apple basket from Mile High Designs. I layered a print from Vol 25 on the front and hung it off my shelves. Thanks for visiting! I hope you enjoyed the tour. 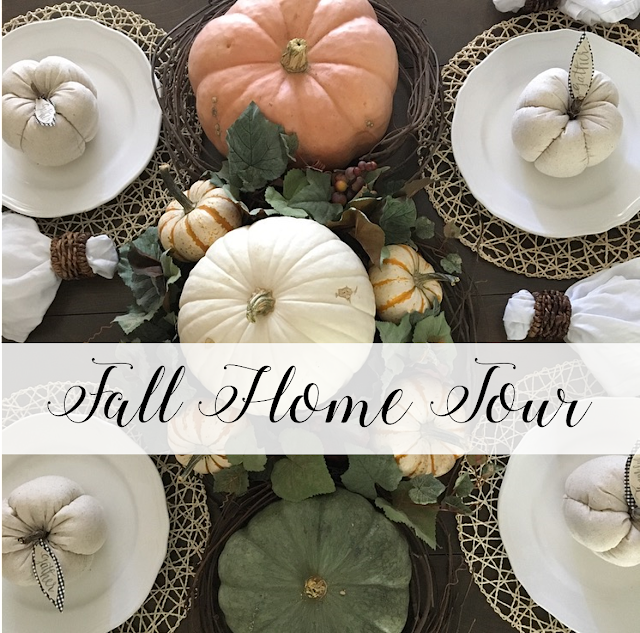 For more fall inspiration check out my friends and fellow bloggers homes by clicking on their icons below! So beautiful, D! 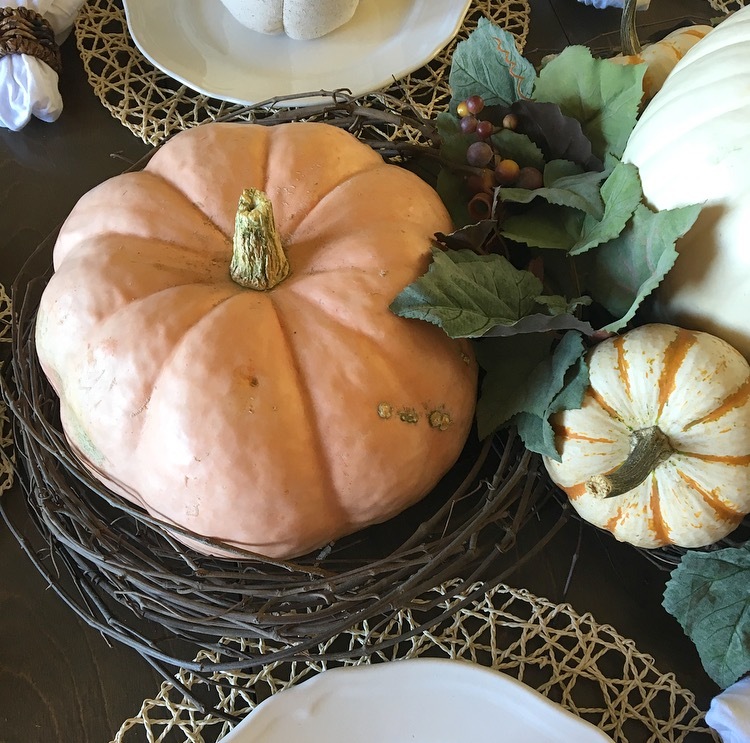 Your home feels so cozy with the touches of plaids and all the beautiful pumpkins on your dining table! So inspiring! Tractor stools!!! I love them!! Love the tree bark pumpkins too! You have so many amazing pieces and cubbies, trays, etc. 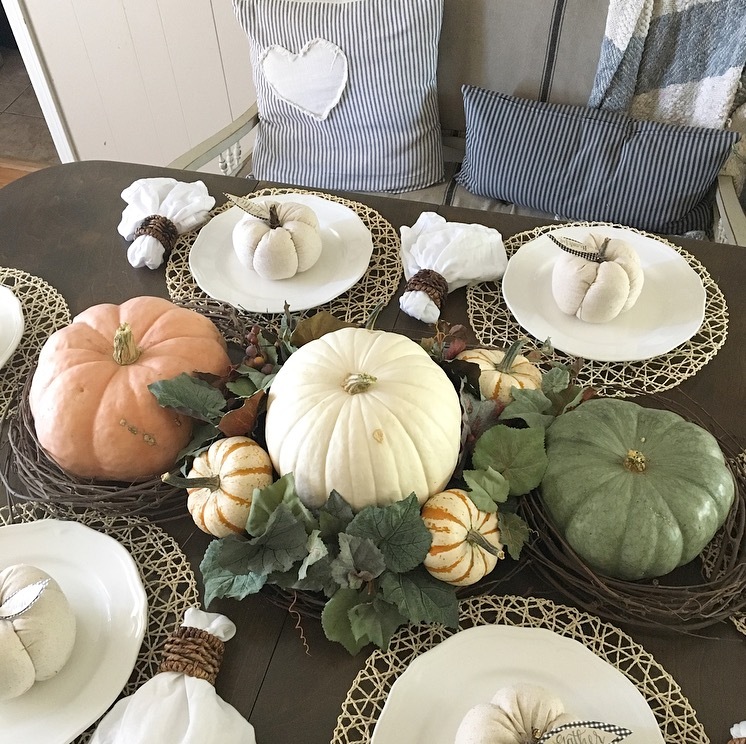 to decorate with :D All looks amazing! Wow Wow Wow! Everything is stunning! I just love your tractor stools. 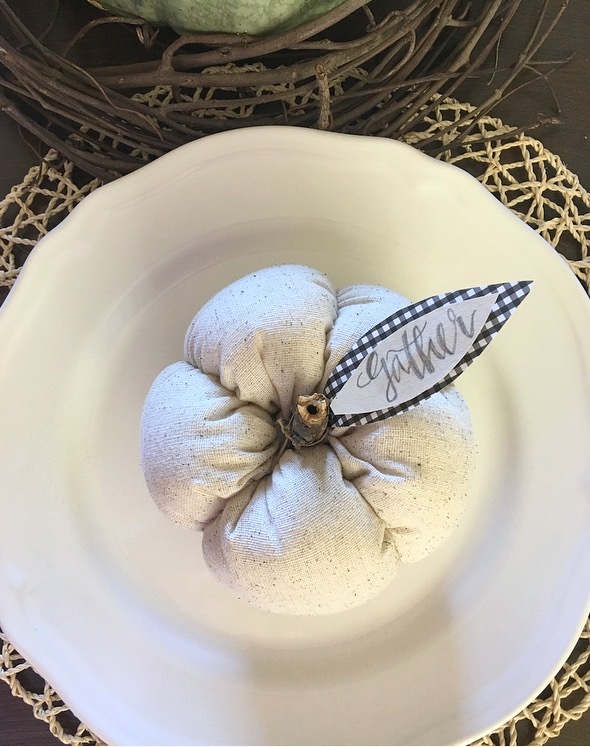 and those bark pumpkins are too cute! Your home looks SO comfy and pretty--I loved this whole thing Daraka! 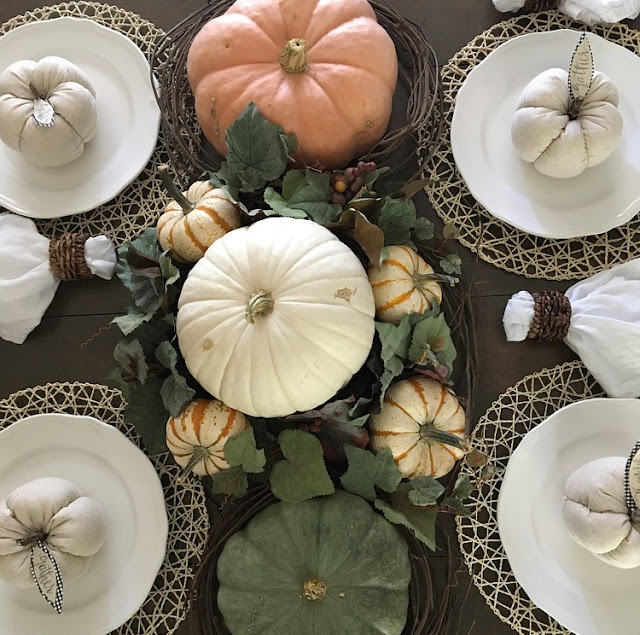 I'm in love with your tablescape centerpiece with those cute tiger stripe pumpkins Daraka! And how cute are those fabrics pumpkins! 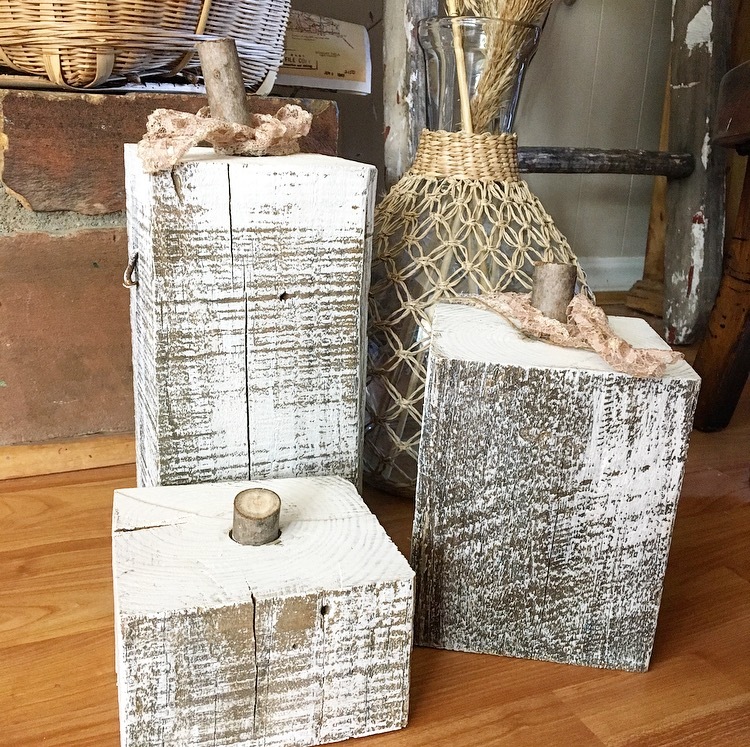 Love everything! Oh and the round mirror with the ornate top is just gorgeous!